USA Basketball is the national governing body for men’s and women’s basketball in the United States. As the recognized national governing body, USA Basketball is responsible for the selection, training and fielding of all USA teams that compete in international basketball competitions, including the Summer Olympics, FIBA Men’s World Cup, FIBA Women’s World Championships, and more. USA Basketball is also leading the charge in the education and licensing of all coaches, clinicians, administrators, and organizations that work with youth basketball participants. Through their USAB Youth Development program, USA Basketball’s mission is to promote, grow and elevate the sport of basketball through service and leadership. 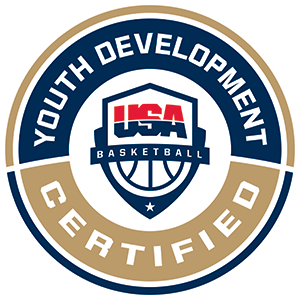 Together with the NBA and NCAA, USAB has created the gold standard of youth basketball coaching by launching the Coach License and Organizational Accreditation programs. For more information about USA Basketball and their Youth Development Program, please visit USA Basketball website.